Results are now available for the Aldgate & Bank Street-O which took place on Tuesday 8 November 2011. With nearly 90 individuals or teams running, it was one of our largest Street-O events ever. Running through the streets of the City during the height of the rush hour, under streetlights, was quite an experience. We are experimenting with providing Routegadget for this series of Street-O events. If you ran, please go to the Routegadget page for the event and draw on your route – you can also compare with where others went. Routegadget has been set up for these events by the series coordinator, Paul Nixon. Found property: A blue trekking towel. Series standings so far are also available and linked from the results page. The third Street-O race of the Winter 2011-12 series takes place in Aldgate and Bank in the City of London on Tuesday 8 September. PLEASE BRING YOUR SI CARD IF YOU HAVE ONE. Special Note from the Organiser: This is a street race and the map will not be of the same quality as at our annual City of London Race – please bear this in mind when running and expect some unmapped features, in particular building sites and some alleyways. Please RSVP to the event via Facebook (link above) to let us know you are coming – you can also see who else is coming here and post queries. Like all our street-Os, this a public race – all are welcome. If you are not on Facebook, please let the organiser know you are coming, at , so that the correct number of maps are printed. In the Counting House pub, which is at 50 Cornhill, City of London. Start and Finish from outside the pub. The pub is often very busy, we have a reserved area upstairs but not a private room so please come dressed ready to run if possible. Bags are left in the pub at your own risk. Nearest tube station is Bank (Central, Waterloo & City and Northern lines, and the DLR) which is a short walk away from the pub. Normal street-O format with clues located at each control site. You have 60 minutes to visit as many controls as possible, in any order, and return to the finish. SI will be used to time the start and finish, please bring your SI card if you have one. Don’t forget to bring a pen to write down your answers to the clues as you go around, and a watch. A headtorch may also be useful. General information about street orienteering. Fluorescent clothing is recommended for safety. The City of London will be busy with both pedestrians and traffic, please be considerate when running. All competitors take part at their own risk. You MUST be over 16 to take part in this event, unless you are accompanied by a parent or guardian. This is a condition of our insurance. The pub serves food until 2200. The second Street-O race of the Winter 2011-12 series takes place in Putney in south-west London on Tuesday 11 October. Please bring your SI card if you have one as we will use this for timing you out and back in – alternatively you can borrow one of the club’s set which we will bring along on the night. In the Fox and Hounds pub in Upper Richmond Road. Start and finish will be at the back door of the pub. PLEASE DON’T RUN THROUGH THE PUB TO FINISH. Nearest tube station is East Putney (District Line) which is a five minute walk away. Putney railway station is also very close by. The normal Street-O format – controls will be clues. You have 60 minutes to visit as many controls as possible, in any order, and return to the finish. A headtorch may be useful. Don’t forget to bring a pen to write down your answers to the clues as you go around, and a watch (both essential!). Please also bring your SI card if you have one. General information about street orienteering. Please note, personal belongings left at the pub during and after the race are left at your own risk. 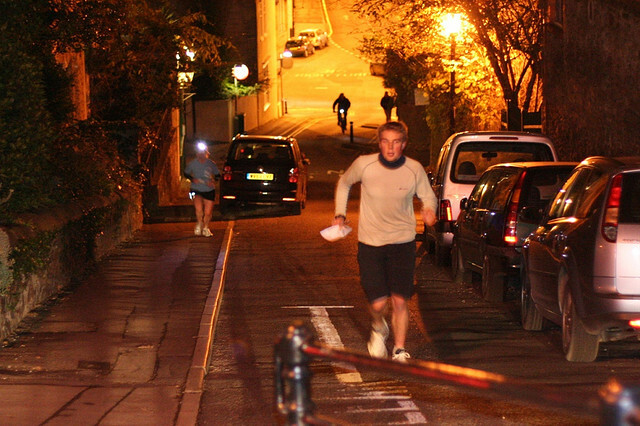 The first Street-O race of the Winter 2011-12 series takes place in Rotherhithe in south-east London on Tuesday 13 September. PLEASE BRING YOUR SI CARD IF YOU HAVE ONE. In The Angel pub, which is on Bermondsey Wall East (right beside the River Thames). Registration will probably be upstairs and the start and finish will be in the park outside. Nearest tube station is Bermondsey (Jubilee Line). The normal Street-O format – controls will be clues. You have 60 minutes to visit as many controls as possible, in any order, and return to the finish. SI will be used to time the start and finish, please bring your SI card if you have one. It will be an advantage to start early and run in daylight. A torch is recommended if you are out in the dark. Don’t forget to bring a pen to write down your answers to the clues as you go around, and a watch (both essential!). General information about street orienteering. The pub serves food until 2100. Street-O is Returning for 2011/12! Now that the summer Park Race series has finished and September is nearly here, it’s time to look forward to SLOW’s 2011/12 Street-O series! The full provisional schedule of events is now available. This year the series has been expanded to 9 races (once a month from September 2011 through to May 2012), with your best 5 scores over the series counting for the overall results. The league table scoring has changed slightly to accommodate the often large turnouts. The first event is planned for Tuesday 13th September (a few days after the City of London race) in Rotherhithe – full details for this race will be posted on SLOWeb very soon. If you haven’t done one of these races before then come along and give it a go – it is a combination of orienteering and urban street racing, with a very competitive league series over the year. Full details are on the general page to explain how it all works – but feel free to series coordinator Paul Nixon at if you want any more information in advance. Photo by xtophe80 on Flickr. Text by Paul Nixon.